The iPad has cases coming in a variety of sizes, shapes, colors and materials since its introduction. Happy Owl Studio has produced a new case for the iPad that encompasses providing a stylish case that still provides protection, flexibility to adjust the case to view or type and the additional functionality of enabling the user to store other items within the confines of the case without going too far overboard. Made of genuine leather with a micro fiber lining that covers the case surfaces that come into contact with the iPad, the Wallet also provide additional zipper-able section that gives the user the capability to place an iPhone, credit cards, business cards, pens and other small items inside; plus there are two more zippered sections that one can store the earphones for the iPad and other items that one may want to have close. 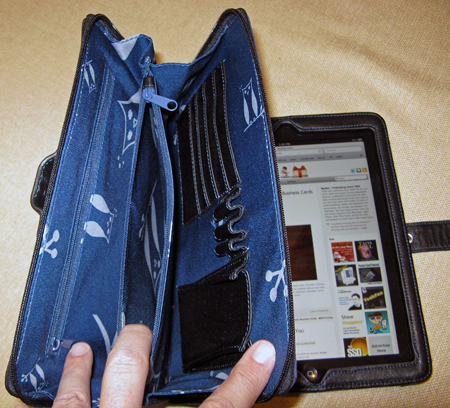 The Wallet was designed to provide functionality along with the style, so the strap that closes and secures the Wallet when one is carrying it also provides the means for one to set up the Wallet in either a position to watch videos or slideshows, plus the capability to set the Wallet at such an angle that one can comfortably type. While a lot of other companies may provide similar cases that enable the iPad user to view or type comfortably, not that many have provided additional space within the confines of the case to carry additional items. Looking over the case, the first thing that one sees is the work that has gone into the design. The iPad slips in and stays in, using just the small tab that anchors the left side of the iPad within the framework. All cutouts are precisely where they should be, allowing you to charge the iPad without having to remove the iPad. Speaker cutout is there, along with the cutouts for volume and mute switch, and the headphone plug, mic and power on/off switch. The left side zippered storage area provides ample space for the things that one would normally find in a comparable case designed for a planner that everyone used to carry around. Now the future has caught up with the past. Walk into a meeting with the Wallet case and you look like anyone else who is there; the case may just be a bit smaller than the normal legal pad size case. 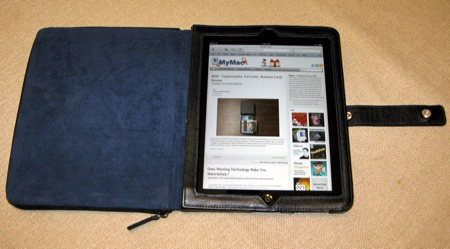 Yet when you open up the case, position the case so that you can type on your iPad and people begin to take notice. Setting up the Wallet to view the iPad horizontally for a video, a slideshow or to just view apps in that manner is as simple as opening up the case, folding the left side of the Wallet back and then taking the strap that normally secures the Wallet shut, and snapping it onto the snap on the outside of the left side of the case and you are ready to watch what you want with your iPad set at the appropriate angle. To set the Wallet to the angle for typing, you would proceed just as you did for the angle for watching a video but just continue a bit further, taking the strap and slipping it through the loop on the outside of the Wallet, snapping it into place and you are now set to type at a proper angle and it remains exactly where you have set it. While Happy Owl Studio states that you can store a variety of items in the left side of the Wallet, such as keys, a mobile hotspot, etc., I would still utilize the space to carry what you want without attempting to place too much in the storage area. Placing an iPhone, a few pens, business cards and the earbuds in the zippered sections, along with some paperwork, is fine. When I tried adding my normal set of keys into the mix, I found that it bulged the case out a bit more than I would like. I normally like to carry a micro fiber cloth along to clean off the screen, that didn’t present any problem as it could easily be compressed within the section. One thing that I really did appreciate is the flexibility that the Wallet provides in being able to bring along other items with your iPad that might otherwise get left behind. Using the case in a work environment has proven to be easy; you have your iPad with you and no one really notices it has an iPad until you open up the Wallet. If you were walking with the Wallet in your hand from your car into a building or even down the street, it just looks as though you are carrying a day planner, when in reality you have a case that just looks like one but contains a device that costs several hundred dollars. Camouflage, hide in plain sight, works for me. Overall, nicely done case for a first time company producing a brand new item. As far as negative items, nothing major to speak of on this case. All in all, based upon my use and its capabilities, I give the Black Wallet for iPad a My Mac rating of 8 out of a possible 10. This does not look appealing. I have seven iPad cases. The one that I keep going back to is the BookBook by TwelveSouth. I like it’s deceptive appearance, damage protection from minor drops, and it’s versatility. I armor up with the Otterbox Defender when I am out in the elements. While not waterproof, it is really heavy-duty. Finally, when wanting a minimalist approach, I slide the iPad into the thick leather gadget pouch from saddleback leather. This Black Wallet screams Cheap China, with it’s shiny, thin leather and the brass latch. I expect it from meritline for 9.99. With the iPad2 on the horizon, it just hope that some of my cases will be workable with the new form factor, if there is a change. Wow, sounds like you have the bases covered with your selection of cases for your iPad. 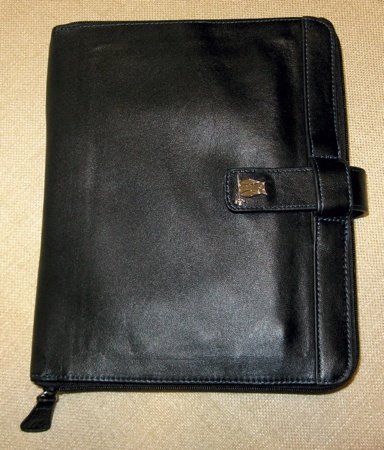 I believe the only case we have not reviewed yet is the leather gadget pouch. Re China, I can’t speak to that but nowadays there are very few things that are not imported to the US from overseas, especially from China. Re future iPads and cases, as you said, hopefully existing ones can continue to be put to good use.